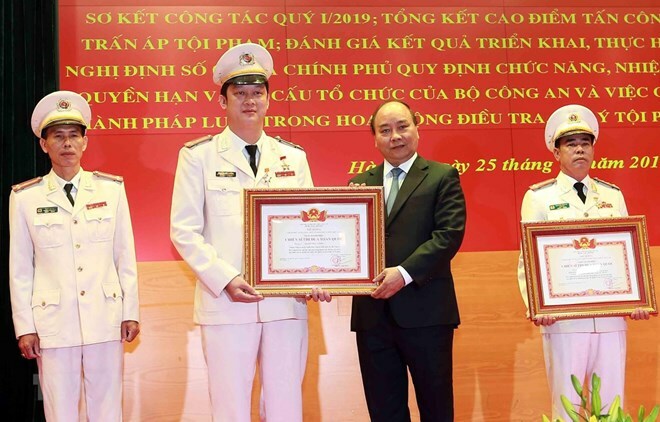 Hanoi (VNA) – Prime Minister Nguyen Xuan Phuc on March 25 requested the Ministry of Public Security to remain vigilant and proactive in the fight against corruption, and exert all efforts to speed up investigations into cases which have drawn public concern. Attending the ministry’s conference to review its activities in the first quarter of 2019, PM Phuc hailed the ministry’s efforts to foster administrative procedures and judicial reforms, including the pilot of granting electronic visas, documents, and identity cards. He asked the force to continue contributing ideas to the Party and State to make decisions on policies and measures to protect national security and interests. The ministry was also required to increase the validity and effectiveness of state management over security, social order, and safety; as well as to make greater efforts to combat crimes in order to achieve a sustainable decrease in criminal activity. Deputy Minister of Public Security Senior Lieutenant General Bui Van Nam said that in the first quarter of 2019, the force implemented measures to thwart plots by hostile forces and ensured absolute safety for key works as well as important political, social and cultural events, particularly the second DPRK-US summit, thus helping to increase the country’s position and role in international relations.